Discussion in 'Muppet Headlines' started by Phillip, Jul 17, 2004. The made for T.V. movie is a go. It's been given the green light by all involved. The Costume department has been at work for over three weeks, and the LA shop is busy tryin' to crew up for any building they may need. 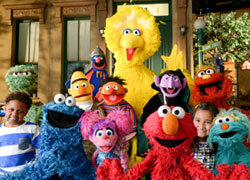 Last I heard they will be shooting in September due to all muppet performers being so busy. For those new to the scene, The Muppet Wizard of Oz is a planned made-for-TV movie based on the original book, not the 1939 theatrical movie. It is scheduled to air on ABC, most likely next Spring. Here is the original release from last March on the project. This is the only "official" statement released on the project. The plan then was to air the film in November, but we're probably looking at next Spring now. Late December, Ain't it Cool News reported this potential cast list. I stress potential because Ain't it Cool News is a questionable source (for some) and things like this usually change in the production process. In a really cool bit of casting, Pepe the Prawn will take on the role of Dorothy's dog Toto. And the role of Dorothy will played by a yet to be cast human guest star. One of the issues that comes up often with Muppet productions, is how well the human guests will interact with the characters. Apparently, it's very important that the humans play it straight, and not make light of their role, or the characters. Michael Caine and Tim Curry are shining examples of this principle at work, while Kermit's Swamp Years shows what can happen when it's not. Anyway, rumor has it that "The Muppet People" (impressed with her guest spot with Elmo on Sesame Street where she donned an elephant costume) may be eyeing Natalie Portman for the lead role. So Miss Piggy may have 2 parts? I wonder who the human guest star will be? I like the rumors about Natalie Portman. I think she would make a great Dorothy and she would interact with the characters well. If she can interact with Jar Jar she can interact with anybody. Yeah. It's not likely for Piggy to play a villian. I sort of pictured her as Dorothy. Still I guess it's a good idea to have a human play Dorothy. Initially, the idea of Piggy as a villain doesn't necessarily work. Until you try to understand WHY she might be motivated to play a villain. The interesting element about Piggy possibly playing the Wicked Witch is her motivation to be wicked. The rumor is that Piggy will be both the Good Witch and the Wicked Witch. Since it's a dual-role, maybe she's the Good Witch until she realizes Dorothy is flirting with her frog, then all bets are off. As Dorothy flirts more and more, this irritates Piggy to no end. Pigs gets into the "wicked part" more and more as the story develops. Something like this might also be a way to get the Kermit/Piggy romance in the story without totally rewriting the tale. If executed well, such scenes could be very good. My bet is on the wizard being human. I'd suggested in this forum a long time ago that in an ideal world, Frank Oz would make a cameo as the Wizard (of "OZ", get it?). More likely than not, they'll go with a familiar actor who's accessible to their budget. Someone like Mel Brooks comes to mind immediately. He's got the right age, look and humor, not to mention he's friends with the Muppet people. He even voiced the snowman from their Chistmas special a couple years ago. That's just my guess. I think he'd do a fine job, though. Either one of those two would be great. I Think Piggy as the witch is perfect! her motivation simple. She wants a new pair of shoes! When Piggy wants shoes she gets them. ask gregory Heines. I think Piggy as the witch is as perfect as it is unavoidable. The witch is, afterall, the dominating female presence in the story, and what Muppet is more dominating than Piggy? I don't buy the whole "They shouldn't make Piggy evil!" line of thought. 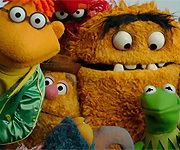 This is the Muppets, after all, and even the most diabolical of them (think Crazy Harry) isn't really evil. Piggy wouldn't be pulling a Joan Crawford ala Mommie Dearest performance here. She'd play an over-the-top, unavoidably appealing and loveable nemesis for the ol' gang from Oz. It's a role that would be true to the character she's been developing since 1975. Now if they'd put her in the role of Dorothy (which I hope they do not decide to do), I think that would be ill-fitting. Piggy doesn't have the naivety and innocence required for that part. She's too powerful an icon. If they decided against going with a human actress for Dorothy, they'd either have to dig Annie Sue out of storage or slap a pig-tail wig on Bean Bunny. After typing that last line, my vote is whole-heartedly in for Bean in a wig. I think it'd be adorable. I think it'd be adorable too, but I doubt it will happen. My vote is for Piggy playing the good and bad witches. Have a human or someone else play Dorothy. Piggy wouldn't fit Dorothy's personality at all. I agree on Piggy. Also, sorry if I'm asking things that have already been repeated, but when is this supposed to air? Whether or not it airs in a ratings month (February or May) will tell us a lot about Disney's hopes for the film and the potential they see for the Muppets. There is also probably a decent shot that the Wizard actually be Bunsen and Beaker, especially since he uses the mechanical head to fool everyone. As an age-old Muppet fan, I find myself wicked embarrassed that it never occurred to me that Bunsen and Beaker could play the Wizard. You're right, they'd be perfect. I wanted to register with you all so that I can respond specifically to this forum about the Muppets Wizard of Oz. I have been collecting and studying Oz for much of my life and had really hoped that something like this would happen. Who better to bring Oz to life than the Henson people, and of course the Muppets? My hope was that they would use a completely new cast of puppets to play the fantasy characters. being that Disney Co. needs to reintroduce the Muppets to the world, in what hopes to be more family friendly fun and less toilet humor and sexuality. So using the already known Muppet Family of characters is a smart move. With luck we will all fall in love with them all over again. There seems to be a lot of talk about Piggy playing both good and bad whitches. This is actually a very clever plot device, that L. Frank Baum (Author of The Wonderful Wizard of OZ) might have used himself. We know that piggy can be both kind and loving, as well as sneaky and wicked, while showing real emotion, but she has always been a Very strong character. All of those elements will come into play in both roles, good and bad. If you doubt it just read the book, (Which the film will be based on not the MGM film) the book is lots better. The wizard will be human, or a very human like puppet, after all he is just a man from Omaha. I had thought that Kermit would make a better wizard after all he is just a simple green frog. I also like the idea of using Fran OZ, the story will play better if they use a human in this role. Also Dorothy will be played by a real girl, and my vote is for a completely unknown actress of about 10. My hope is that the Henson/Disney folks will do the book justice and follow it as closely as possible. The MGM film while being truly great leaves much of the story and original plot out. It is not a story about shoes, but about believing in yourself, and knowing your own heart. Through its humor and polite charm, it reminds us that we already have the heart, brains and courage in side of ourselves all we have to do is believe in our selves, keep home in our heart and miracles can happen. I can't wait! The Muppets will make this a HIT!